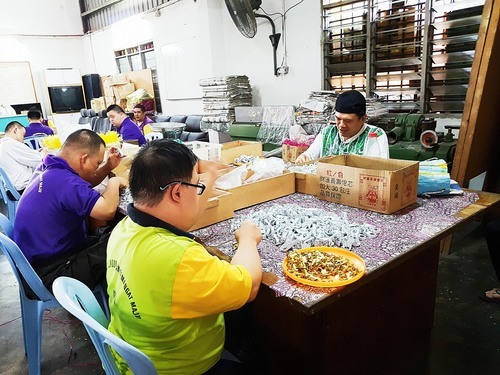 BENGKEL PERLINDUNGAN SEMANGAT MAJU TAIPING helps intellectually disabled adults providing workshops on social skills and overall development skills that can help them to be more independent and find suitable employment. Our vocational training involves woodworking, crafts and souvenirs-making, oriented services such as serving in eateries, sales assistant in supermarkets, factory workers, and sewing, among others. We continuously upgrade our facilities and work on related projects to help them to be integrated into society. Enable adults with learning disabilities to learn new skills. Enable them to be independent workers. Stimulate the learning process through new gadgets and innovative skills. Teach them how to follow instructions. Increase motivation to work and increase attention span. 100 people with disability have benefited from our centre. Some of them came to us with low social skills and not being able to follow simple rules. Nobody wanted to employ them and we were the only place where they could go. We help them to learn skills and to find employment.